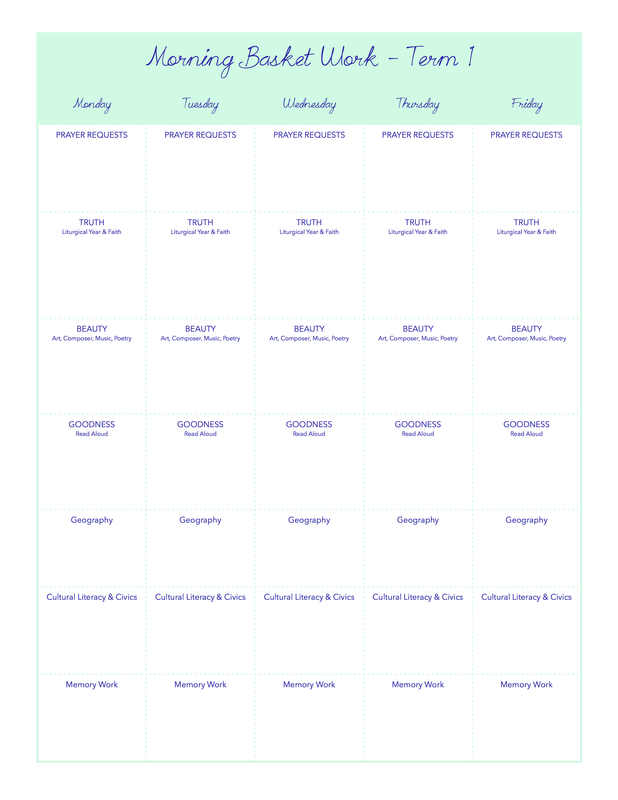 I promised a look through my new Morning Basket binder when I shared our Term Plans and Printables with you, and here it is! I had hoped to get this posted last week…but alas the beach called louder! You understand, don’t you? I’ve always collected all my Morning Basket papers and resources in a few different files, but after years of different baskets and resources and lists I was finding my filing system too cumbersome, not to mention the small bits of paper that never seemed to get filed…thus…the binder solution. I’ve always used binders for collecting and organizing various collections of papers, so I just intuitively grabbed for a notebook again. 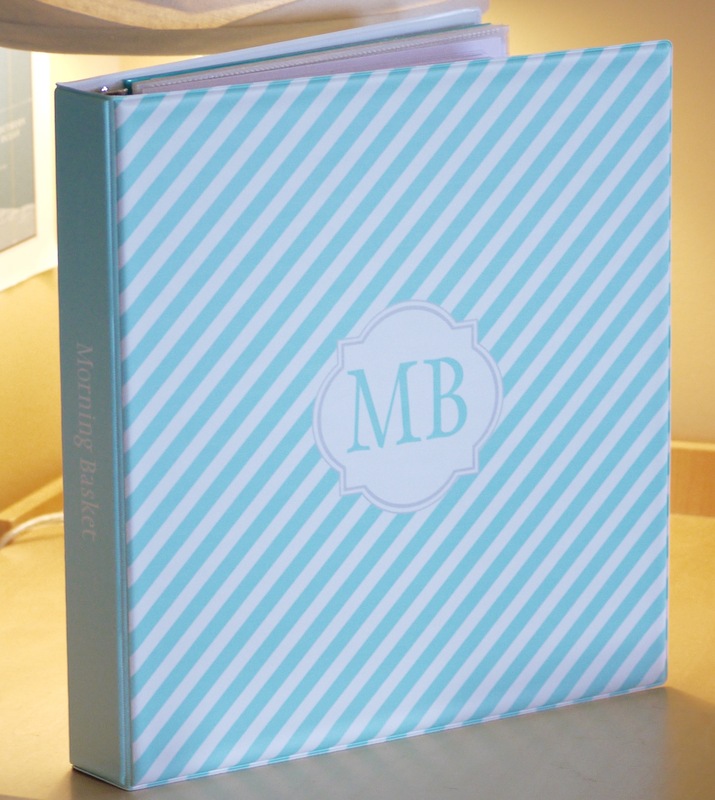 Only this time, I happened to see this pretty Tiffany Blue & White Striped Pattern Binder that was totally customizable at Zazzle!! I love how cheery it is in my favorite color, and I confess, I’m wondering if I can come up with about 7 different new notebook needs so I can get a few more!! LOL!! I love all the different personalized office products they have! My new notebook arrived quickly, so I started assembling all my resources and adding them. I’m not really content with the interior organization right now – for one thing, I know I want to tab this out a little more – but I was ready to roll with our year, so I gave myself permission to just add stuff and GO! and I’ll add some organizational features during my Term break. Do you do that, too? Sometimes we’ve all gotta roll with good enough! AND…the advantage to giving myself permission to go with something that is “less than perfect” right out of the gate is that after living with a tool for a bit of time, I now KNOW how a tool works for me, and how to intuitively organize it FOR ME. So sometimes it’s actually better to roll out the skeleton of a tool or a plan and let yourself live with it for some time – get to know it! Where do you flip to most often? Are there papers you use every day that should be in a “favorites” section? 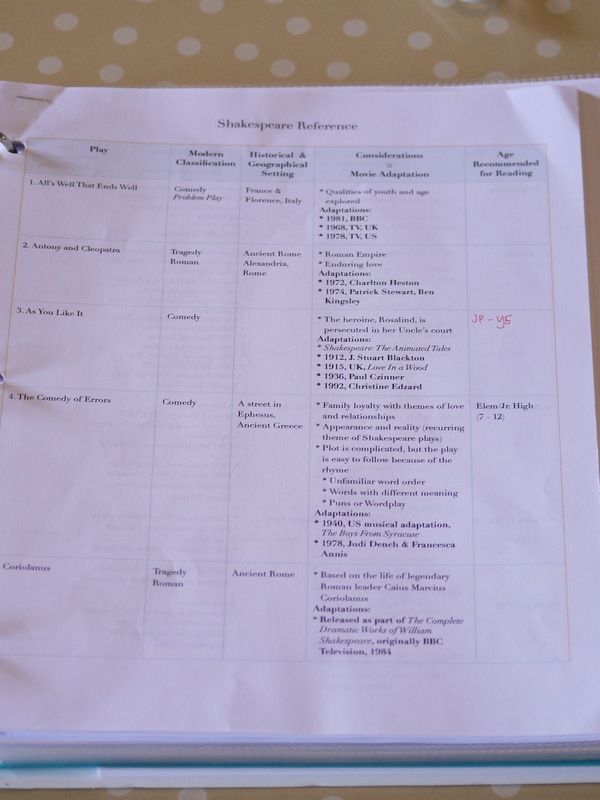 Do some papers need to be grouped together? Would some papers work better in sheet protectors? You get the idea! Don’t be afraid to roll with good enough, friends! Before I show you the inside of my Morning Basket notebook, I realized that I have more of a Morning Basket system that has just naturally grown over the years. There are the resources…and then there are the books and the basket…and there are the plans……and then there is the thought that goes into the Morning Basket to begin with. As I started putting this post together I began really thinking about what I do and how I do it, and judging from the questions you all send me, you’re pretty curious about this, too! How does it work? How to plan it? What to put in it? And how to live it! So…I’m going to start a series of Morning Basket posts that will focus on different aspects of my own system and also invite you to ask some questions. I’ll do my best to answer your questions, and I’ll also open the floor (in comments) to others that have wisdom and experiences to share. Maybe your questions will inspire posts I haven’t thought of or considered yet? And what’s exciting is that so many of us are already chatting about Morning Baskets! Meredith shared hers here, Pam has started an entire podcast on Morning Baskets (I’m in one of them…my first podcast ever…and it was so fun chatting with Pam – such a delightful hostess! ), Cindy Rollins left all of her Morning Time posts up on her blog, and I know there are others sharing! So perhaps we can jump start a little more sharing on the Morning Basket! Join in and share some pictures of your books, baskets and ideas! 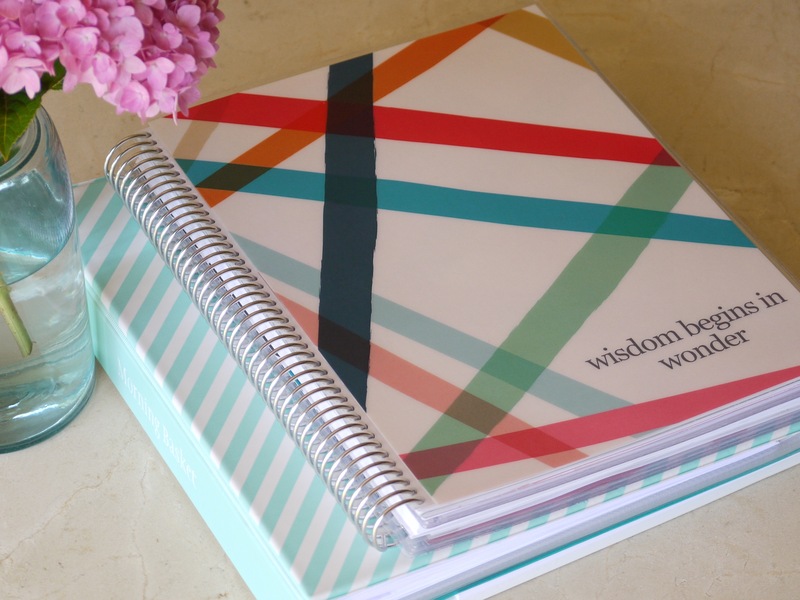 The Master Notebook – YOU’RE HERE! 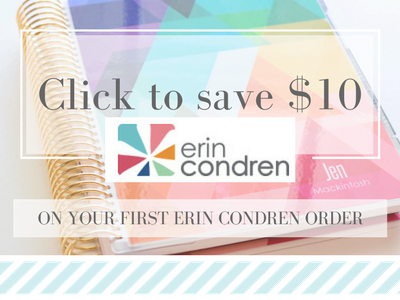 Using an Erin Condren Teacher Planner for the Morning Basket – Coming soon! Ideas for Planning Your Morning Basket – Coming soon! Favorite Morning Basket Read Alouds – Coming soon! I’ll share some photos of my Morning Basket notebook (the 3 ring binder in the picture above…more on the other notebook in a future post! ), and a few printables along the way – so click, download, print, and use whatever might work for you! Collect all current poetry, memory work, hymns, folk songs, printed biographies, and resource materials for our current morning basket along with my current term’s Morning Basket plans. Collect and organize past Morning Basket plans as well as master lists of the read alouds and memory work we’ve completed over the years. 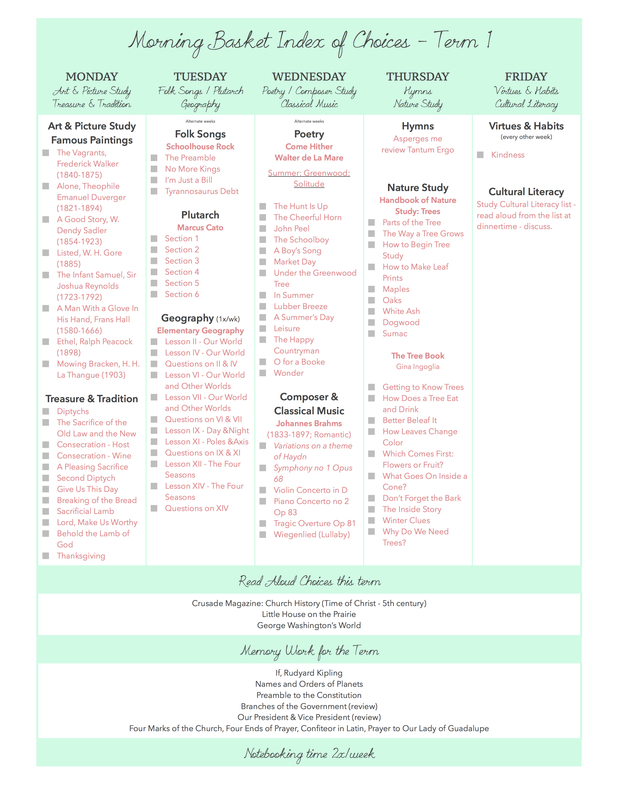 Lesson planner for Morning Basket lesson plans. Confession: One of the things I really wish I had been better about was assembling master lists, which I did not start originally. I have lists for individual children, but not Morning Basket lists! >>gasp<< However, I do have all my original plans, so I’m recording all of our Morning Basket work from previous years so that my lists are current. If you’re just starting out…for goodness sake learn from my example…start a master list now! Sure, it may look sad right now if you’re just starting out – with only one dear little book title and one poem listed, but in a few years your list will grow and you will find in it a treasure full of memories! I’m working on some Master Morning Basket templates for recording lists, and I’ll share here when I finish them! What’s in my Morning Basket notebook? My term plans are first up in my notebook, and I am finding it so nice to plan and live this term’s plans since they’re listed in this way. A little time spent before a term considering: art, songs, memory work, poetry, etc., means that I just look at the day of the week, the choices for that day, and list our daily work for the week. 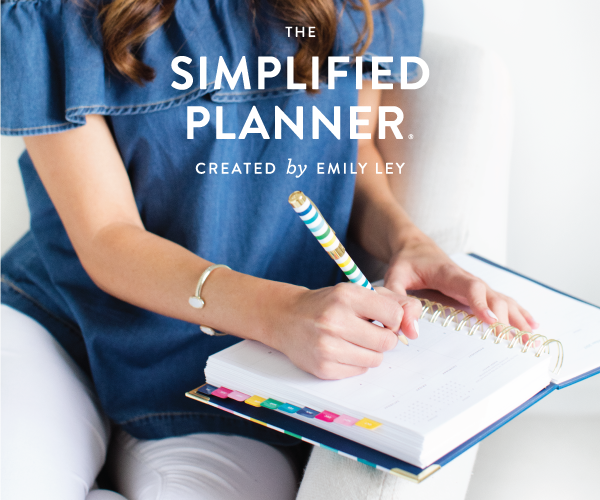 It’s simpler to plan it week-to-week, simpler to live it, and streamlined in terms of how much time it takes out of the whole day. This time factor was a major consideration for me this year with my high schooler. I value our common time spent together in Morning Basket, and I needed it to be a little more streamlined. This year, it is! Different years, different ages/grades, babies/toddlers in the mix or not – all these variables factor into my thoughts when planning a Morning Basket. These are the seasons we live – plan accordingly! Click here to download these plans. 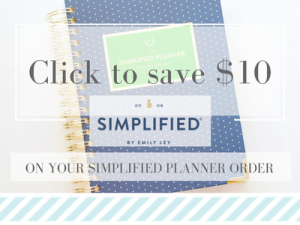 Click here to download the planning grid. I wanted to show you that each interior cover of this notebook (front and back) has two pockets rather than the usual one pocket. These are super handy! I keep local flyers for events here, or I might tuck in a printed resource that might help with nature study – there are always uses for little pockets in a notebook! 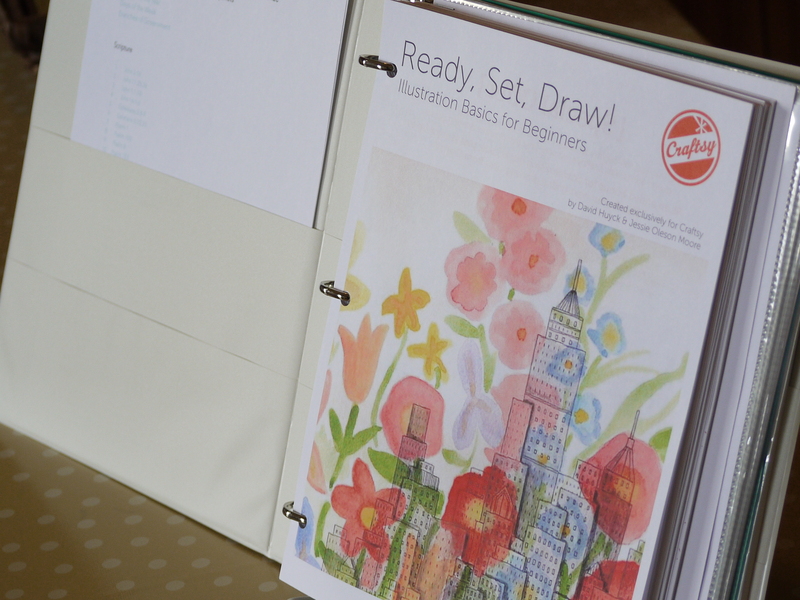 Ready, Set, Draw: Illustration Basics for Beginners – this is a free course on Craftsy. They’re fun little exercises which we complete together as an extra on Fridays. The kids really enjoy the exercises! I keep a paper copy of the poetry we’re memorizing for the term in here. 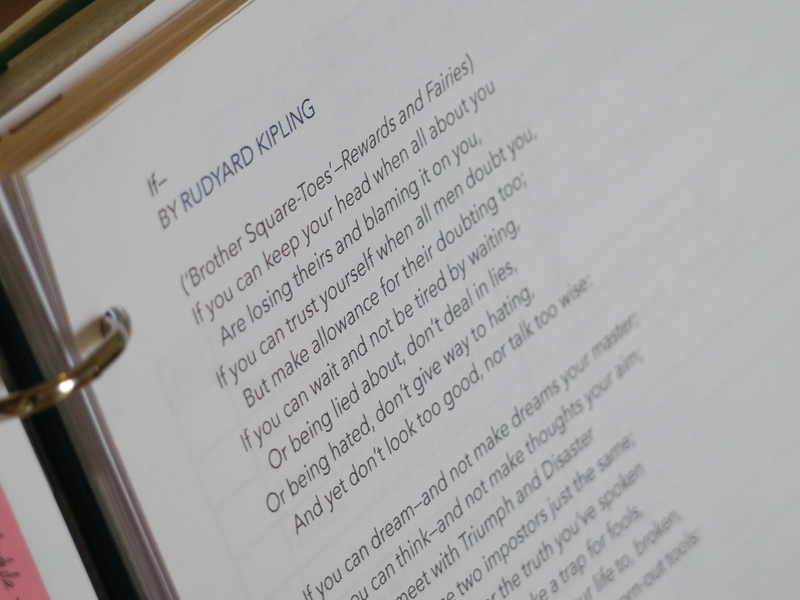 Sometimes we’re working on a couple of different poems at a time, and many times we review an older poem so it’s nice to have a paper copy of poems in the rotation. I build lots of indexes and compilation listings that are a HUGE help to me in staying organized and moving smoothly through our Morning Basket work – especially those subjects we may take years to cover. 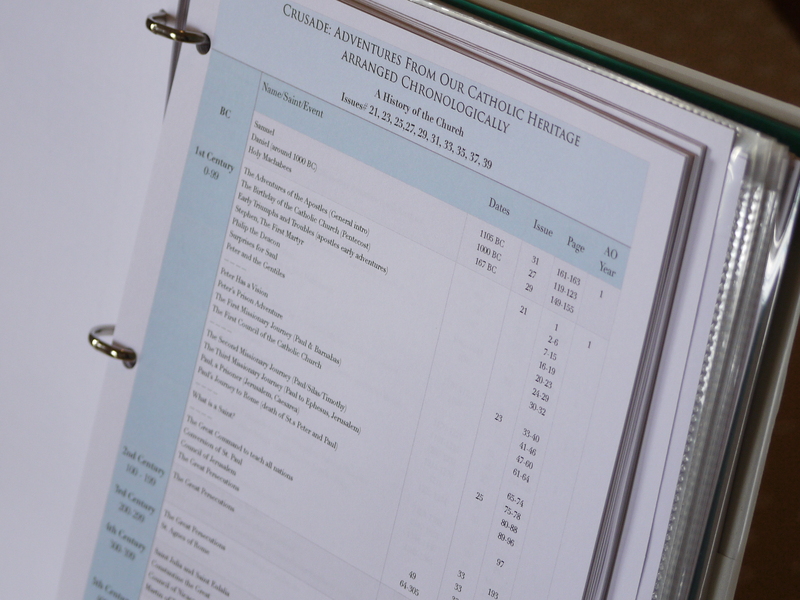 I shared with you in this recent Morning Basket post that I built a chronological index of the Church History volumes of the Crusade Magazine. I keep a copy of that in my Morning Basket binder for ease of reference. You can download the Church History Index for Crusade magazine here. You might find that a simple table of contents copied from the book you’re reading helps you plan – it could land right here. I also keep review notes or study aides that are for a particular book we’re reading in our Morning Basket. Click here to download this printable table of all 37 of Shakespeare’s plays with (my) notes. Click here for the index of G.K. Chesterton’s Famous Paintings (described in more detail this post). Sometimes I set myself up for a week during the summer with some inspiring and free podcasts. My go-to place for inspiration is Circe, and this summer I really, really enjoyed listening to Andrew Kern’s podcast on Socratic Teaching! What a fabulous talk! I took copious notes and came away with lots of ideas – many of which I’ve translated into our days, especially with my high schooler. I translated some of my notes into something I can use with prompts to help guide me – because I’m visual and when it comes to application of ideas I need to *see* it! Are any of you like that, too? I’m not going to publish/share this table since it’s basically just a representation of Andrew Kern’s talk, but if you listen to his talk, you’ll come away with the same ideas I did! The table I made is really just a translation of my notes from Andrew’s talk – and they provide visual markers for me as I try to apply some of these Socratic Teaching Principles in our home. 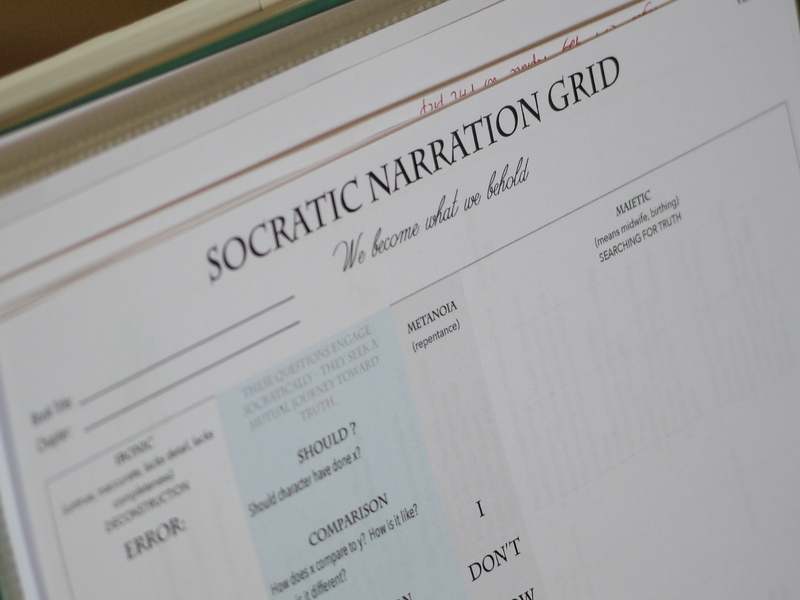 I use it as I prepare lessons for particular books, and to review steps as I walk “big ideas” through the narration process using this Socratic guide. It’s been immensely helpful! Thank you, Andrew! Lives From Plutarch by Pleasant and Audrey Graves, Joseph Macfarland translator – this is my favorite children’s adaptation. 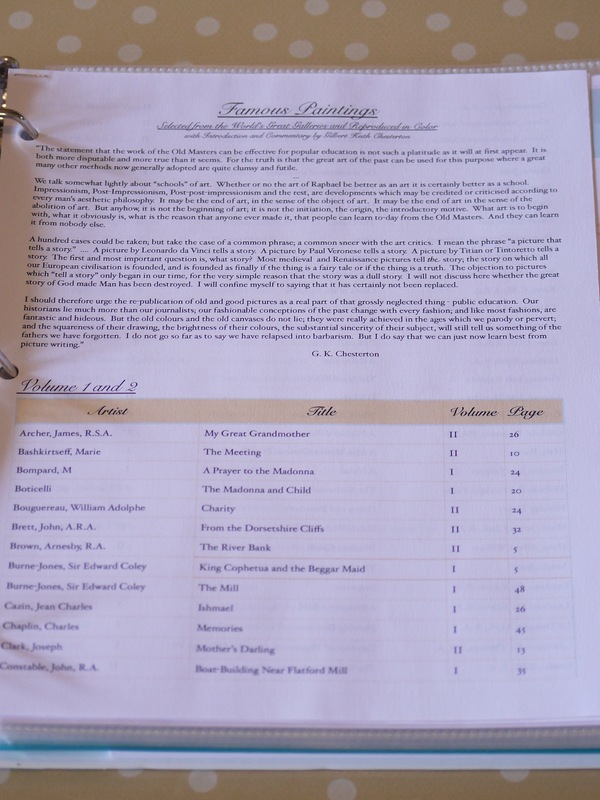 Since we’re using Ambleside Online (with adaptations) I find it very useful to keep a copy of the spreadsheet document that Ambleside provides that lists all the books for every year of Ambleside. I use it to organize our home library bookshelves (by Ambleside Year – one shelf/year), and I also use it to note which books may be listed that I move to the Morning Basket rather than to a particular year’s reading. You can find the complete booklist for Ambleside Online Years 1 – 12 on this page. You may be wondering: which Ambleside Online book selections work well in the Morning Basket? Free reading selections are fantastic here! These are classic books – forget the year they’re attached to and pick a few great ones and add them to the lineup! If you’ve been using AO all along, then a free read is a great way to enrich your Morning Basket choices. Moving AO books to the Morning Basket is particularly helpful if you come to Ambleside a little late in the game, or perhaps you skipped a book here or there. Year 3.5 and Year 7 History and Literature selections contain (in my opinion) some of the best books – not to be missed! If you somehow missed these along the way, add these to your Morning Basket! Less is More. Set out a very few, quality toys and books in little baskets around the rooms where we read and work. Rotate toys and books out often. Keep bins of toys/games/books waiting to be rotated OUT of the general population’s grasp so that when they come out – Behold! They are new and fantasmal again! Another idea is to entirely repurpose a closet in your home as a toy library, which is what we have done. Put a lock on it. I’m just sayin’. Think outside the toy-box! Be creative in offerings – tiny inflatable swimming pools are FANTASTIC and so alluring when you blow them up (no water – that’s obvious, right? ), plop them in the middle of the living room with a few plastic bowls and spoons from the kitchen and place toddler within! Trust me – that one will buy you some quiet reading time! Think outside the box when it comes to toddler happiness during read aloud time! Set yourself up for success. I do not set out toy groups with crazy, noisy, or small pieces that will make me want to stab my eyes out with a pencil as they’re littered all over the house, deposited in the dryer, and lovingly tucked in my shoes…all while I attempt to read aloud. Soft, quiet, non-electronic is the name of the game if you actually want to be able to read over toddler play…and even then…no guarantees! Develop your reading voice and project! So that’s my notebook! It’s a living notebook – which means it will change and grow as I add to it over the coming weeks, months and years! I didn’t take a picture of the notepad I keep in the back of the notebook, but I thought I’d mention it since a simple notepad is pretty handy to have for jotting ideas, notes, challenges, etc! And I have lots of sheet protectors for tucking away catalogs and little snippets of ideas that need a place to land. I’ve already been working on my next post and it’s almost ready to share! I’ll be back soon to show you what I keep our Morning Basket lesson plans in and how that looks! Here’s a little hint…. Drop me a note or question in the comment box if you have one and I’ll do my best to answer! See you back here soon! Still new to the idea of the Morning Basket? Wow! Love it. Thanks for your generosity in sharing all of this. Wow! Love it. Thanks for your generosity in sharing all of this, it’s just wonderful. Just a note, your index link leads to the grid printable. Totally inspirational post and I look forward to seeing all your past work, big job to tackle though I know. I’m embarrassed to admit I don’t plan our morning basket’s to that extent. It’s more like, what are we doing this term, dump. but I’m inspired to lay out, love the look and ease. Didn’t realise you had done a podcast, I’m woefully behind in listening to podcasts, must listen. Suggestion, you could host a linky party at the bottom of your morning basket posts. Thank you so much for this post, I always find inspiration on your blog. I am using a morning basket again this year but I have been winging it and it is not working so well. 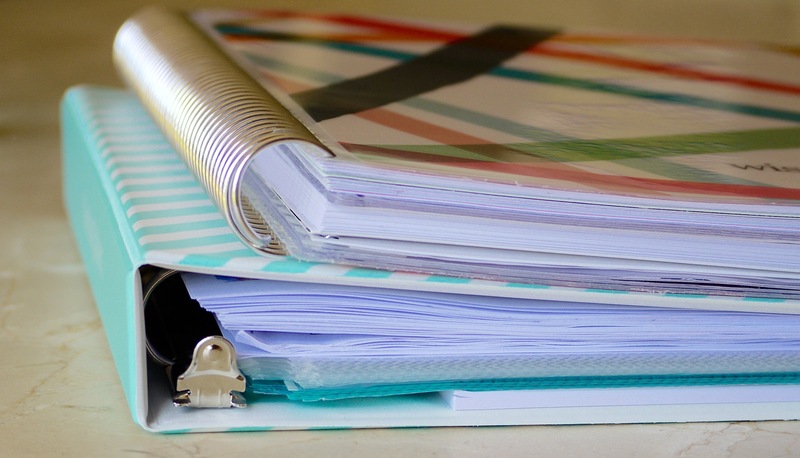 I am going to get out my planning folder right now and do some serious organising! Thank you so much for your kind words, Becky! And happy planning! Sometimes that’s all I need, too – a little nudge and a couple of ideas to get rolling! I’m excited for you and hope you are excited about your time spent with your Morning Basket folder!